Some one decided a few years back that the conservative movement needed to have some attractive women as spokes persons. Back a bit ago, Noelle Nikpour performed intellectually for everyone to see. Today in the Chicago Tribune and elsewhere, Rachel Marsden displays a similar dim-witted view of science by making several snide suggestions for topics at the upcoming Durban environmental summit. It's actually hard to tell if this column is meant to be serious or sarcastic. Rachel's gives some advice, "Don't waste time fiddling with the planet's thermostat." Ah, Rachel, if only it were that easy, but even you realize that if a gym can't control the temperature, the Earth is harder, but part of the idea of a gym is to sweat. She seems confused about how heat works, but the problem is not the ceiling height because heat rises, so it's coolest near the floor of the gym, but the Earth works rather differently. It's warmest at the surface because of the atmosphere's insulation. Rachel thinks "nuclear energy is the future." But the reason many of us oppose its expansion is not because we're "worried about a nuclear energy facility going all Chernobyl on [us]", but because no one wants to talk about the camel in the tent which is what do you do with all terribly toxic nuclear waste for the next 25 million years? Rachel say "imposing green alternatives almost always results in dirtier ones", and as an example she says that if she wasn't given plastic bags at the grocery store she'd have her purchases delivered, thus wasting even more energy. Oh, and Rachel sending non-decomposing plastic bags to the dump as garbage bags is not a form of recycling, and little needs to be said about your little snippy remark about "faith-based" pollution except that a George Carlin you ain't. Rachel thinks "excessive tree-hugging is suffocating the foliage". "Plants need carbon dioxide to live and produce oxygen. Humans need oxygen and need to eat plants." First blame environmentalists for saving forests. Second, sounds like Rachel avoided all that hard sciency stuff because her simplistic views lead her to a huge misunderstanding. OK Rachel, you see the rates of both respiration and photosynthesis increase as temperature increases, but respiration increases fastest and then photosynthesis actually begins to slow down, so plants respire, sort of like "eat" but more sciency, more of their own energy resources leaving less for consumers. At higher temperatures more tropical trees die and all that carbon dioxide stored in their wood gets released by decomposition increasing the amount in the atmosphere and you have a positive feedback system where temperature increased the CO2 and CO2 increases the warming, leading to run away global warming. Data exist that demonstrate this could happen (see link), so it's not just an "abstraction". Lastly, Rachel thinks there is an "ongoing epidemic of ensconcing kids in liberal arts programs to educate them far beyond their intelligence." Wow! It's a terrible thing to be educated beyond you intelligence, but it looks like a career as a conservative columnist and political strategist is possible. But then Rachel says science and technology along with critical thinking should be encouraged and innovation will arise without using any gummit money. Hmm, the Phactor always thought that the key aim of liberal arts programs was to teach kids to think critically, and maybe that's the problem because then they are able to see easily through these comments to their dumb, silly cores. And then one wonders how we are to interest kids in science and technology when the entirety of the conservative movement is waging war on science and higher education. Are we to encourage innovation to solve problems that you deny exist? Hard to know exactly what this woman wants except to criticize and belittle any and all efforts to deal with environmental problems. But as we all know, such changes begin small and locally, so get a shopping bag Rachel to carry your cabbage head home from the grocery. Without doubt this is good research, but really, you needed rats to document that caffeine gives your brain a jolt? All you have to do is observe everyone participating in the five-day rat race, and almost everyone of them jump starts their cranium with caffeine. Wish the Phactor could apply to the Juan Valdez Foundation for coffee research. But that's science for you. It's not enough that it works, science has to find the caffeine receptor sites deep within the brain, invent a cranial coffee port, and then pour the stuff straight into the brain! And the best part is that it's still legal. A pragmatic approach to solving real environmental problems is something much needed and this online publication may help: Solutions. Looking for pragmatic solutions involves dealing with people as people rather than hoping human nature changes, dealing with politics as politics rather than hoping pols will begin look any further forward than the next election and monied interests, and dealing with nature as nature rather than hoping the Earth loves us. Such a pragmatic approach is the opposite of denialism, a lose-lose strategy, and this more than any other single thing will be the undoing of the GnOPe as they move farther and farther out of touch. And that’s not to suggest that the opposition is doing all that much better. But let us know what you think about this journal. Honestly, the Phactor has been too busy to read more than a hand full of the articles posted, so feedback is welcome. A good friend was on the faculty at the University of Minnesota in Duluth, and as he put it, "Duluth is not the end of the Earth, but if you stand on your car's hood you can see the end from there." Monday is not the end of the semester, but when the Phactor stands on his chair he can see it from here. Now is when steady, diligent work the whole semester pays off. If students aren't on top of things now, it's basically too late. Students asking for help have run out of time, but you try to help them anyways. One fellow wanted to know what he was doing wrong, and after analyzing his approach, the answer was simple; he was doing everything wrong. Poor notes, tired old highlighting of text material, no integration of lab material, and so on. His old study just before an exam was totally inadequate for the volume of material being covered and he was over-whelmed. If the skills do not progress and continue to improve, the wheels begin to fall off as advanced undergrad courses stress the system. And this happens to pretty bright kids too because high school, and then all too often community colleges, just don't push them along or challenge them sufficiently to induce changes, and the bright ones get by pretty well. About half of the struggling students know something is wrong because they figure out that not everyone is having a problem; the other half know it's poor teaching. Their expectations and the reality of higher education are just not matching up. A few are still plagued by inattention, immaturity, and disinterest, and these are not a winning strategy for any endeavor; maybe the think the Phactor doesn't notice that they are playing with their little wireless toys. In the end this is what you end up evaluating, those who can and those who can't, or rarely those who won't. The food quest of a couple of days ago is being put into action, and the Phactor has just spent 30 mins carmelizing a pound and a half of purple onions. Apparently a dozen or so people are coming for brunch tomorrow. So let's see what's cookin'. For starters, curry-spiced bloody marys, shrimp with eye-popping, sinus-opening cocktail sauce, a Phactor speciality (love that horseradish), and a modest little chicken liver pate on slices of baguette. The main dish is a lovely smoked salmon potato frittata with dilled sour cream accompanied with some baked applewood bacon, an arugula salad with balsamic carmelized onions, and a rosemary foccacia (semolina used here). For finishers, an apple-cranberry crisp and a spiced (5 spice powder & almond flour in here) cranberry almond bundt cake with orange frosting. More or less our usual Sunday morning fare. 'Tis the season when many people purchase decorative conifer trees; otherwise they own some ersatz version thereof. No option exists in our household because Mrs. Phactor is of the most firm opinion that only a natural tree will do. On an ecological basis cut conifers are grown as a crop and can be fully recycled. So here is your holiday conifer primer. 1. Evergreen is not synonymous with "pine tree" or "conifer". 2. The vast majority of trees sold this time of year are firs, douglas-firs, or pines, and these are three different genera (Abies, Pseudotsuga, and Pinus respectively). 3. Douglas-fir is not a true fir, but most confusingly it's also called Oregon pine and Douglas spruce. See the problem with common names? Here's how you tell these three genera apart. One pines needles are in clusters or bundles of 2, 3, or 5. The other genera have needles borne singly upon the twigs. The common pine species sold as cut trees have two (Scotch) or 5 needles (white pine). Firs and Douglas-firs have different buds at the end of twigs. Firs have resinous buds, that is coated in resin, and rounded in shape. Douglas-firs are smooth, dry, and conical. Distinguishing among the various species of firs is too tricky for verbal descriptions. This particular house/garden plant has always been reluctant to flower. While most of the tropicals flower annually, and reliably, this particular bromeliad (Tillandsia cyanea) often goes a couple of years between flowering events, but then the display is long lasting and quite attractive. Like many tropical plants the long lasting display is produced by colorful bracts composing a large inflorescence. One or two short-lived flowers emerge daily. This is typical of pollination by hermit hummingbirds who travel a path from plant to plant across the rainforest and the inflorescence serves as a beacon for that particular stop on their daily travels. This species has large flowers for this genus. 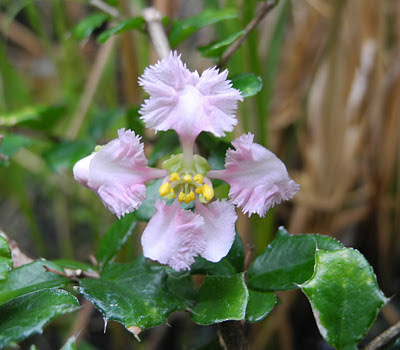 The plant itself is easy enough to grow in a hanging basket of orchid mix and soil. The grassy leaves are tempting to the felines, so growing it aloft keeps them apart. Yesterday was a beautiful November day here in the upper midwest. On Monday last our prairie study site was burned, a fall rather than a spring burn. The reason for this hinges on observed differences in time of seed dispersal for two species, a native and an invasive bush clover. The invasive bush clover tends to hang onto its seed very late in the season, so how much of its reproductive potential will get damaged by a fall burn? The answer to this question will probably be not enough, but you never know until to try it and determine the answer for certain. So yesterday we collected seed from scortched clovers and from the litter that tends to accumulate under dense stands of the invasive clover, and in another month or so, after a cold treatment, germination trials will be set up. No matter how toasty the whole place looks, none of these herbaceous perennials are damaged by these fires, so the parent plants will not be harmed. Now in a side story the Phactor was driving the F1's slick silver coupe because it was making a "noise". It's a very nice late model ride, but not exactly cut out for field work. Please understand that after spending a couple of hours out on a recently burned prairie, you get pretty blackened from the knees down, rather smoky flavored, although not as smoky as doing the actual burn, and you have dirty bags of plant material. The good news is that this particular sport coupe has good traction in the mud and made nary a wayward sound. The smoky odor should fade in a few days, but too bad about the floor mats. Shhh! Don't tell! “It must be said at once that this book is better than having a sausage stuck to the end of your nose.” (Mark Golden’s review of a book by S. Pomeroy in Classical Review). How's that for not a very favorable review? Oh, but this one might top it, especially in science. "It is quite possibly the most overwrought, absurdly contrived, pretentious expansion of feeble post hoc rationalizations I’ve ever read. As an exercise in agonizing data fitting, it’s a masterpiece." (P. Z. Myers, infamous blogger). Go here to see what publication this applies to. Good thing he doesn't review botany. On the Phactor's honey-do list is a quest for several odds and ends, more the former than the latter, for some sort of cooking event. Five-spice powder is most commonly composed of star anise (a basal angiosperm), cloves, cinnamon (but the Chinese use Cassia bark instead of real cinnamon), Sichuan pepper (not real pepper) and fennel seeds, blended to achieve a certain balance of jin and yang. Sounds like a trip to an Asian grocery, which is always fun. Almond flour, and here we certainly hope this wasn't supposed to be "flower". OK, so some really finely ground almonds must be somewhere. Dill weed. This isn't a problem, and the weed means foliage as distinguished from dill seed, but while dill is rather weedy, it does seem rather a harsh label. Semolina flour is puzzling. By definition semolina are the middlings, the little pieces, left over after grinding durum wheat into flour, so it's either flour or semolina not both, and yet there we go. Maybe this is simply a way of designating durum flour from breadwheat flour, and it is hard to tell tetraploid endosperm from hexaploid endosperm once it's made into flour. My real worry is that everything is an ingredient in a single recipe, sort of like that goofy cooking contest show where the chefs get a basket of ingredients and have to combine them all into a dish. At least this list doesn't include cheetos like one of the baskets on the cooking show. Pretty funny that, giving cheetos to a chef. This happens frequently to the Phactor, monthly actually, and in high correlation with the arrival of one or more cooking magazines. Maybe that's why yesterday my shoppinglist included a turkey red wine, limoncello, and several bottles of very dry champagne. This is sounding better all the time. So we are thankful that we have, and can afford, and enjoy, such bounty. Nocturnal flowering is rather uncommon even in the tropics. Quite a few flowers open in the evening, for example, nutmegs, but the flowers remain open through the next day at least. And of course there are several bat and moth pollinated flowers. Several palms flower at night attracting hordes of beetles. But a completely nocturnal orchid is news because of all the crazy things orchids do, nocturnal flowering was not one of them. Since this orchid (Bulbophyllum nocturnum) flowered in captivity no one is certain about the pollinators, but some type of small insect certainly, perhaps a small dipteran. The dangly little filamentous appendages are strange, and they may either mimic some sort of insect or help disperse a particular floral odor, or both. In general the flowers of orchids in this genus are pretty small, ca. 1 cm diameter. Unfortunately and particularly with the fadish approach to science funding in the USA, even the small amounts of support needed to fund tropical field work are difficult to find, which makes such discoveries really difficult. So here's the situation, the hydrogenated Glycine max oil had been creamed together with crystallized, purified vacuolar sap from Saccharum, two sterile ovules of the domesticated Asian jungle fowl, and an ethanolic extract of fermented fruits of the Vanilla orchid, so it was time to stir in the shredded endosperm of Cocos nucifera, the chopped embryo of Juglans regia, and the candified, ground seeds of Theobroma cacao, only to find that the most critical ingredient, finely powdered endosperm of Triticum spp., was insufficient to the task at hand. Now some 5 hours earlier that the Phactor's vehicle was checked into an out patient auto center to get new tires, so fortunately the people's grocery is only about a 20 min walk away, but walking home with 11 lbs of ingredients indicated the utility of having at least a cart. The preparation time certainly did not take into account not having all the ingredients on hand. Still Ms. Phactor and F1 seemed to approve. While many people act, and drive, as if their automotive vehicle (aka car) is an extension of them selves, a statement about their personality and immaturity, cars hold no particular fascination for the Phactor. Fortunately my use of a car is far, far below average, although owning one remains a necessary convenience, but basically cars are in the same category as toasters, just a lot more expensive. You want one that daily delivers a nice even golden brown on both sides and accommodates bread, bagels, and baguettes with equal ease. However if you cannot park one yourself, you shouldn't be driving one. Decent toast is life requirement because it is how you start your day. The best toast in my memory was a perfect baguette served with a platter of tropical fruit and a very, very good cafe con leche on a patio overlooking the Pacific coast of Costa Rica (think rainforest meets Big Sur). OK the location probably had a great deal to do with the memory, but it was good toast. Having been blessed by location, shrewdly chosen, the Phactor does not drive on a day to day basis having lived within walking distance to his work place for 40 of the past 42 years. As a result over the past quarter of a century, the Phactor has only owned two vehicles, both were quite reliable and served my purposes quite well, but as my blog is not monetized, no endorsements are forth-coming. But today sitting in a waiting room of an automotive service establishment reminds one how annoying vehicles can be if not reliable. In this particular case after nearly 9 years and 55,000 miles (only), and with winter approaching, the car needs new tires. Even still this place is bleak beyond belief, worse than an airport and without the people watching. If only the toaster could be balanced for browning as easily as these tires. Does a good toaster actually exist? How can someone have such good fortune with vehicles and yet be continually displeased with toasters? The current machine toasts with total indifference, a perfect lemon, whose most redeeming quality seems to be its color. So if anyone can recommend a make and model both competent and reliable it would be appreciated. The petunias in the window boxes outside our front bedroom windows after producing a pink cascade for at least 5 months died two nights ago. This is not so surprising actually since petunias are not cold hardy at all, so the first good frost or freeze of the fall always does them in. But what was surpising is the date, November 18th, a very late date for the first killing freeze (about 25 F). The weather had flirted with frost a few times, but here in our urban heat island it was never frosty enough. Most gardeners recognized how late the season was in a variety of ways, and then they nod and say "global warming". While the Phactor is positive global warming is real, such departures from normal averages are just weather. Over the long haul more frequent deviations produce a climate trend. Models of global warming predict more extremes, hotter hots, colder colds, wetter wets, dryer drys, early snow storms, late freezes, and so on, but greater amplitude in weather may not cause a change in the means as they tend to average out. 2011 had a late spring, cold and wet, and it pushed flowering back (in comparison to 2010) but then a very late mild fall that was very good for the baby bok choi. A local green action organization is having a recycle everything you didn't think could be recycled day, and one of the things that can be recycled are plastic pots. The Phactor knew that if he saved them up long enough, in big stacked sets, they'd be good for something, or someone would get around to recycling them. Apparently plastic pots can be recycled into plastic landscape "timber"among other items. How appropriate. And that's good because you would like to think that gardening is a pretty green industry and there's all those plastic pots. A few plant providers have switched to pots composed of organic materials that just decompose, although some seem to take too long. More alternatives are needed. Now to load up the stacks and destroy the evidence of my plant buying problem. It's sort of like hiding those candy bar wrappers in the garbage. Actually it can be slightly embarrassing when recycling all the wine bottles too. It's not that so much wine is consumed, just that our recycling is done so infrequently. A favorite small shrub in our glasshouse is this week's Friday fabulous flower, commonly called "miniature holly" (Malpighia coccigera) because of the glossy, spiny margined leaves. Like many members of this family (Malpighiaceae) the flowers have spoon-shaped petals, here ruffled and fringed to boot, and while not large they are produced in great numbers making for a very attractive display. This species, native to the West Indies, is used as a tropical ornamental. The fruit is a red berry and edible, as are several larger species whose fruit are better known as Barbados cherries or acerolas. The flowers have a funny fragrance, not altogether pleasant. In between the upper three petals glandular sepals can be seen that secrete an oily substance as a reward for the bee pollinators. The genus is an honorific for Marcello Malpighi (1628-1674), professor and naturalist at Bologna. He was an early anatomist making contributions to both botany and zoology (malpighian tubules). My habit has been to put all my tropical houseplants outside for the summer. And now is the time to bring them inside again, great advice because it's actually about a month past the time to bring houseplants indoors. Some don't like it when the nighttime temperatures drop below 50F. Some are tougher and don't mind some cooler nights. None like frosts. Most are in hanging baskets, so several orchids, bromeliads, gesners, and epiphytic cacti get hung in various places, usually in part shade for the better part of 5 months. Several bonsai trees, figs, a Pittosporum, a Bougainvillea, a podocarp, sit on shelves inside a cage to prevent squirrel damage. In particular the hanging plants respond very positively to this treatment, and they flower reliably as a result. This is undoubtably because they get enough long nights outside while inside even a flash of light can interrupt the stimulus. Presently a couple of orchid cacti, an orchid, and a gesner are in full bloom in a 4-season room where they all reside during the winter months. Several more will bloom later in the season, and a couple have been featured here before: the queen's tears, an azalea. Your houseplants also look rather nice hanging out in other wise dull areas of the garden, but several trees have become jealous and regularly discard a branch or two upon the houseplants. That no serious damage has occurred is a wonder. When inside, all these epiphytes growing is rather porous mixtures do quite well when their pot is soaked once a week. This is done by immersing the pot in a sink or bucket and letting it soak for awhile. The larger ones are set upon stools and given a light shower of ever so slighlty tepid water for 10-15 mins, let drain, and then rehung. It also keeps them free of dust. The real trick is finding enough nice places for them inside. GOP Dumps Presidential Candidates, Launches So You Think You Can Govern? Reality Show. Story here. You know this just might work better than anyone could think. Uh oh! Some of the fine citizens and the upstanding high school principal in Ronald Reagan’s college home town of Eureka have decided that the Daily Show’s coverage of politics is not appropriate material for a high school politics and government class, so after parent and student complaints, a 1st year teacher has been suspended, at least for now. For those of you who do not known Lincolnland, our state consists of one great big city, a handful of small cities, and a whole big bunch of small rural towns nestled in the maize and soybean agricultural desert. The Phactor can certainly sympathize with these people. You certainly don’t want your children to ever encounter any different opinions, any discomforting ideas, or any material that might make them uncomfortable. Proper schoolin’ should help them to remain smugly assured that their views, values, and ideas will never be subjected to any criticism particularly when that education is paid for by taxes. Any first year teacher of politics and government should know that the correct way to teach is to drone on about the 3 parts of government and how it was an OK idea until the presidency got too big for its britches especially when the office is not occupied by the party of choice in these parts like back in the good ol’ days of Reagan. Bringing in current events and popular culture to stir up interest is terrible teaching. No teacher should openly disparage political candidates. They should use clips and quotes from news sources, perhaps even the Daily Show, so that students can actually hear what the candidates actually say, you know, all those historical, geographical, political, and constitutional gaffs, which of course is exactly what the Daily Show does. What teaching moments they provide! No teacher disparagement required; just let students listen to and evaluate what politicians actually say. But rather than suggesting to their children that they figure out how to respond appropriately, how to defend their positions intellectually, how to make a case for their support of a political position, these parents whine to the principal who suspends the teacher. If people want to know why the educational system in this country is not what it used to be, parents and principals like these are the reason. They don’t want education; they want indoctrination, oh, and their children admitted to our state colleges and universities. It's hard to describe rainforest diversity to people who have not seen it, but it's even harder to visualize. This is a false-color image of a rainforest where each color represents a certain degree of tree diversity, different species, different genera, or maybe different families. The ability to image diversity this way based on reflective differences in species chemistry will allow many studies of rainforests that simply aren't possible from the ground, or if they are possible, then in much shorter amounts of time. But you wonder what it means when what appears to be the crown of a single tree is a collage of a dozen or more colors. Lots of epiphytes? But this just looks cool and you really need the big box of crayollas to do this kind of work. You only need a box of 8 to handle most temperate zone forests. Of course, seen in real life it's just all green. Too bad it's not really all these colors, not even in Oz. A flower lover does not like the Phactor's "analytical" approach to fabulous flowers. How sad. 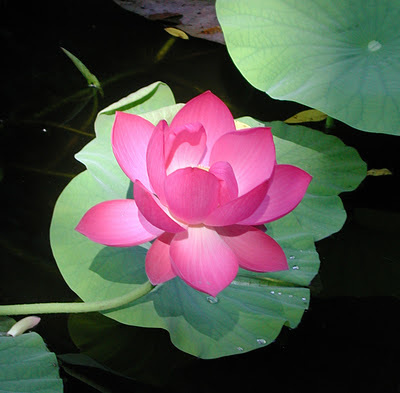 A lotus flowers in my garden pond, and no lovelier flower exists on Earth. No wonder the lotus has figured so prominently in Eastern art and religions. 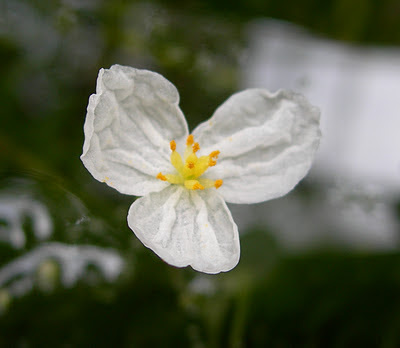 In addition to its beauty a great many things are known about this flower. The lotus is very distinct from and not even closely related to the water lilies that bloomed in the same pond earlier in the summer. The lotus flower functions to interact with pollinators producing a most unusual fruit containing its seeds. The 135 million year history of flowers and their evolution into a myriad of forms is a marvelous story, and waterlilies, not lotuses, are a remnant of that very ancient stock from which today’s diversity of flowers sprang forth. This flower lover wants to know why botanists such as the Phactor cannot just appreciate flowers like the lotus for what it is without dissecting it and taking it apart. Can’t we just look at it and say it’s beautiful and leave well enough alone? Well, no. That just isn’t good enough. For one thing, curiosity demands looking deeper. Although the lotus and waterlily look much alike in a very general way, they have many obvious differences, and botanists want to know why both similarities and differences exist. While both lotus and waterlily flowers are very pretty that information doesn’t answer any questions, and even that leaves the Phactor wondering why the aesthetic senses of humans are tuned to interpret some flowers as pretty when they are adapted by natural selection to attract certain insect or bird pollinators. The failure to appreciate the aesthetics of flowers is a symptom of clinical depression, so certainly looking beyond the shallow it’s-a-pretty-flower-and-you-don’t-need-to-know-anything-else perspective is warranted on both sides of the human-flower equation. This brings the Phactor to a last point, a very important point, detailed knowledge of and an in depth understanding of a flower, of a lotus, in no way diminishes my aesthetic appreciation of the flower. And why would it? Do Civil War historians have a diminished appreciation of the valor of the soldiers because they know of the impact of many mistakes, miscommunications, and chance events had on the outcome of events? Does a painting have any less impact on art historians because they know about the palette, brushes, and personal woes of the painter? Ah, but historians are students of the subject they love and admire, and the unidimensional flower lover is not. In return the Phactor wants to know what kind of mind, what kind of intellect is it that doesn’t want to know any more or isn’t curious about natural things? What is such a mind afraid of? What kind of intellect settles for the simplest and most banal of explanations (it was created that way)? In most cases in my experience they are worried that a quest for knowledge will gore a very sacred cow, their religion. How truly sad. Especially in biology where literally each and every time biologists have pursued a detailed course of study, the results, the understanding acquired, are quite at odds with religion. But a lotus, which isn’t even mentioned in the Bible, by any other name, would still grow from the navel of Narayana, and its leaf would still carry Kamadwa down the Ganges. And the saddest thing of all is a wasted intellect. So many years of academic life have resulted in the Phactor having a terrible day-date disconnect. It's not that dates for events are unknown to myself, it's that the date is not connected to my daily/weekly world. That an event is happening on the 14nd is known, but that the 14nd is today is not. This has evolved because my life has always revolved around scheduling on a MWF or TR basis upon which a sequence of lectures and labs is superimposed, so dates are little needed. Perhaps some of the problem is the carefully cultivated and nuanced forgetfulness of a senior academic so preoccupied with weightier thoughts that some lapses can easily be understood and forgiven. Department secretaries remind me when classes start and students bug me about finals, and it all works, mostly. A weekly desk planner has been in service for years and the transition to computer scheduling, weakly attempted, has always seemed more trouble than it is worth. But trouble began when flipping forward a couple of weeks and then back, one extra page was turned and lo and behold, 30 days hath September, April, June, but November has 37, or so it appeared having done the same week twice, and no, lectures and labs were not repeated; the Phactor is absent minded, not senile. So now there are 3 weeks left in the semester, not 4, and rather than congratulating myself for being more or less on schedule, things are rather a bit behind, and therefore quite normal. And so the world turns, and we return to the regularly scheduled calendar of events, and the professor gets to announce an exam, on a Monday. This is certain to help the teaching evaluations. Dear AP, Although personally unaware the globe was shrinking, the Phactor can only say, "It's about time the rest of the campus caught up to biology!" Although you may be unaware of this, international boundaries are human constructs that have little meaning to biological organisms or biologists except as they serve to restrict our activities. Biology is a global field, so when next a legislator wishes to know what benefit is it to the people of Lincolnland that some of us study rain forest, at what they imagine to be state expense (doesn't the Phactor wish they were picking up the tab!) you will be there to say biology was the first field to be truly global and what happens in the tropics actually can have quite an impact here. Rather than taking students on European tours, ours actually go on field trips where they go, and stay, and study rainforest biology learning about dozens and dozens of species. Please understand, the Phactor is not a tour guide. You go on to say the campus needs more international diversity. Great! Biology could not agree more and we already study more species than you can imagine. Why there are probably more than 500 exotic species of plants in our glasshouse alone, and they could use more space. All by his little old self the Phactor has studied and published on more species than the whole rest of the non-biological campus, who more or less total 1, humans. Perhaps yours truly could be considered for the next diversity award for which a species list will be provided demonstrating his committment to diversity. While humans and their institutions have dithered, embracing or fearing, globalization, biologists have been whole heartedly global for at least a century. So should you need any assistance, any advice, any suggestions from people who are leading the way, feel free to call. Oh, and given that biology is achieving our stated goals so well, might you not put in a good word with your boss that letting biology dwindle through loss of positions is counterproductive to globalization and diversity? Good luck with the new position. It's sure to broaden your horizons. All the best, TPP. Our glasshouse is home to a great many species that are used mostly in teaching for a great variety of reasons. Today's flower (see if you can guess what it is) is fabulous only because the plant seldom flowers, especially in captivity, and at about 1 cm diameter even then the flowers often go unnoticed. As can be readily seen, this is a staminate flower of rather simple construction consisting as it does of 9 stamens and 3 petalloid perianth parts. Quite likely our glasshouse resident is a single clone, and therefore a single "male", so pistillate flowers are not going to appear. Yes, when you take a big hole and fill it with money it can look a lot better. Nearly 100 years ago a pond was constructed in our garden by the first owner of this property. By the time the Phactors purchased the pond, it was basically a concrete and rubber lined tub, albeit a large one, ~18 x 28 feet, filled with leafy muck and annually covered with duckweed. Fortunately our sacred lotus hid most of the ugliness and was quite happy to take over the entire pond. To help stimulate the economy, the decision was made to throw money at the problem and renovate the pond and install a water circulation/filtering system, and a nice cascade. The lotus is now confined to a submerged tank to prevent future conquest of the entire pond. It took the entire summer of intermittent work to finish the project, but the results were quite nice, nice enough to help you forget the cost. Of course now the landscaping has to be done, and nothing like three new Japanese maples to economically start the project. Here's a look, although from this angle only the bottom of the 4 foot tall, 10 foot long cascade can be seen. And it sounds nice too. Who knows when this little mnemonic device was learned, but soon it will be rendered unnecessary by technology. My watch updates nightly from a satellite signal, so changing to CST from CDT is automatic. And my PC figures out the time change without any problems. Same with cell phones, so the Phactor is told. So why is the Phactor so out of sorts from just a one hour shift in time? Oh, that's right, cats don't have a reset button; cats aren't atomically timed, but organic feed-me timers, and no amount of explanation about the reasons for this time change have had any impact at all. So at precisely 6:30 AM CST (cat standard time) a black nose touches mine, and a black paw on my cheek is a purring means of inquiring "are you in there?" The reason for cat standard time is simple, a chunky housecat can starve to death in an hour's time. Resetting cat standard time takes about two weeks; hope we both survive that long. Gardening is our exercise program, and this is not a complaint, but just about now deciduous becomes a very dirty word about this time of year. Big trees, and several in excess of 4 feet dbh grace our gardens, and big trees drop lots of leaves, so even for those of us who are not overly fussy about what constitutes a lawn have a simple choice, remove the leaves or watch your yard revert to a woodland, quickly. Actually in many parts of our yard, spring beauty, bluebells, trillium, and wild ginger grow willy-nilly here and there, and parts of our yard are dedicated to spring ephemerals and a woodland landscape, so you end up drawing a line somewhere. A garden service already removed a great many leaves when we were too busy to do so, and today the Phactors spent their day removing a second accumulation of no small proportions, and the oaks and hackberries (yes, more than one) have yet to give up the majority of their crowns, so another accumulation is in the offing. If left until all the leaves were down, the accumulation would be inches deep in many places, so perhaps letting it revert to woodland is not such a bad idea, but the gardens look so nice across a green sward. So we got our exercise today. Now leave us alone! Here's the Men with Day Jobs singing the Denial Tango. It's terribly funny, clever lyrics, and it wistfully reminds the Phactor of days long gone when time was wasted in little bistros and cabarets listening to folk musicians where clever music was the rule. In particular the Chad Mitchell Trio was a favorite. How great it would be to have a pub with entertainment like this! Those were the days, my friends, we thought they would never end (Mary Hopkin). HT to those NZ science bloggers. The Secretary of Education wrote a letter to teachers for Teacher Appreciation Week, and you might say it pushed the wrong button for a high school biology teacher, but you know, it's good to have a good rant every now and again. Let it out! "I read your Teacher Appreciation Week letter to teachers, and had at first decided not to respond. Upon further thought, I realized I do have a few things to say. I'll begin with a small sample of relevant adjectives just to get them out of the way: condescending, arrogant, insulting, misleading, patronizing, egotistic, supercilious, haughty, insolent, peremptory, cavalier, imperious, conceited, contemptuous, pompous, audacious, brazen, insincere, superficial, contrived, garish, hollow, pedantic, shallow, swindling, boorish, predictable, duplicitous, pitchy, obtuse, banal, scheming, hackneyed, and quotidian. Again, it's just a small sample; but since your attention to teacher input is minimal, I wanted to put a lot into the first paragraph." You can read the rest here. Yes, what he said! The Phactor would probably like this fellow. During a recent interaction with a student who expressed doubts about evolution, they contended “that the fossil record just doesn’t support evolution; it just doesn’t add up.” Translation: I really don’t know anything at all about the fossil record, but most people won’t argue with me because they don’t know any more than I do. Well, that isn’t the case with the Phactor. Do you have an example of where the fossil record just doesn’t add up? “There are too many gaps,” he answered. Like where? “Well, fossils just suddenly appear in the Cambrian,” he said. Do you know that the fossil record of life, microscopic organisms, actually extends back to well over 3 billion years? No, he didn’t know and was only parroting what he had been told, and as a pre-med student he had avoided all those organismal courses where he might have learned some of this. The issue of potential medical students who don't understand or accept evolution is another matter. Most undergraduate students really don’t know just how extensive our historical knowledge of life is. Some of the publications can be rather overwhelming for undergrads, and especially for amateurs, but if you want to peek at one to give yourself some idea of what is actually known, and in what detail, the AoB Blog provides a description of some work published just a bit ago along with links to the papers. The particular paper highlighted attempts to compare ages of plant lineages based on the earliest known fossils (the minimum age) with ages estimated by various molecular clocks (rates of change in DNA) , which generally provide an earlier age, e.g., rocks versus clocks. A tremendous amount of scholarship is represented in this 45 page long scientific article. It takes me an entire semester to explain enough about plant diversity for this all to make sense. The Mermaid's Tale blog is hosting the 41st Carnival of Evolution. Click over for a look around. This isn't a presidential debate, so lots of good items even in a month of skimpy contributions. Susan from NZ sent the Phactor a question. Her plum tree has some large, whitish fruits instead of the green, olive-like normal immature fruits. She wondered if perhaps they were pollinated by some other exotic fruit tree, but no. This is the result of a fungus disease, Taphrina pruni, infecting the fruit and altering their development. This is not as common as another species of this fungus that causes peach leaf curl. The first time you see this disease it can be quite strange because of the appearance of the fruits. Here's an image from Susan that shows both normal and infected young plums. But as you may guess, a heavy infection destroys your crop. Sometime back the Phactor introduced you to our Cat's Claw Vine, but not the business end, the claws. This vine is a grappling climber, not a twining-vining climber or a tendril climber. Each leaf consists of three leaflets, two photosynthetic ones (bent to the left in this image) and a terminal or middle leaflet modified into a 3-parted claw. It climbs by grappling any irregular surface. The claws grapple the surface and then the weight of the vine "sets" the claw in place. It's pretty amazing what this vine can climb, and it's lower branches do a good job of way-laying you as pass by. The claws are not very big as you may judge from this image, but they are quite tough and the tips quite stiff and hard.